Okay, Thom Yorke's solo show wasn't entirely solo. Nigel Godrich handled some of the additional musical production while Tarik Barri stood opposite managing the striking projections. But Yorke handled all the dancing and the guitar, keyboards, and vocal duties. 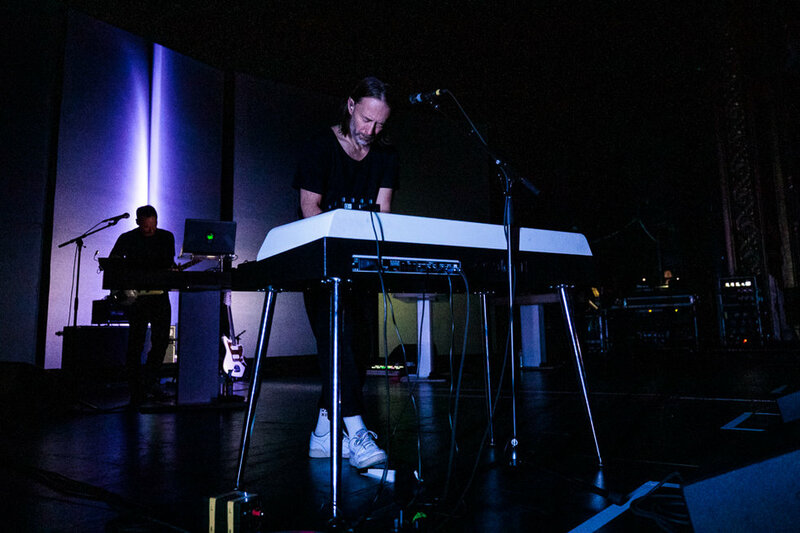 The Radiohead frontman's music was the draw for the evening, and Yorke quickly sold out two shows at King's Theatre in Brooklyn (just a few months after Radiohead played several sold-out shows at the much larger Madison Square Garden). The solo tour follows the release of Yorke's score for the remake of Suspiria, directed by Luca Guadagnino (whose film Call Me By Your Name came out in 2017). But the show couldn't wallow in only the often desolate songs of that score. Yorke performed tracks from his other solo efforts, The Eraser and Tomorrow's Modern Boxes, as well as tracks from his Atoms from Peace project (that includes Godrich). For two hours, the audience watched dazzled, though not as many were dancing (shout out to the couple in the boxes stage left), by Yorke. For me, the best section of the show was near the middle with the audio trio of "Cymbal Rush", "The Clock", and "Two Feet Off the Ground" combining with visual variation. However, there were so many other moments and songs that stood out including "Black Swan", "Default" (an Atoms song), and the show closer, the lovely "Unmade" from Suspiria. One fan captured video of the whole show; that and the setlist follow photos of Yorke's performance below.